Home > Arts > Black Panther Roars. Are We Listening? Letitia Wright in Black Panther. Popular discussions about the movie demonstrate a desire for representation in commercial media. Marvel Studios’ Black Panther, opening tonight in theatres across Canada and the United States, is pretty much guaranteed to be a hit. It set records for advance ticket sales on Fandango, its soundtrack album debuted in the No. 1 spot on the Billboard charts and industry estimates point to opening-weekend revenues as high as US$170 million. Director Ryan Coogler and star Chadwick Boseman appeared on the cover of the industry trade magazine Variety, while British GQ styled actor Michael B. Jordan to recall Black Panther Party activists. The red-carpet premiere made a splash on celebrity and fashion blogs, and it’s the most-tweeted-about film of the year. Marvel’s had big hits before. But this feels like something different. The Black Panther, also known as King T’Challa of Wakanda, was created as a comic book hereo in 1966 by artist Jack Kirby and writer/editor Stan Lee. Although considered the first Black superhero in American comics, this is not the first time we’ve seen a Black superhero in the cinema. Comedian Robert Townsend gave us Meteor Man in 1993, Shaquille O’Neal portrayed the DC Comics character Steel in 1997 and Wesley Snipes starred as Blade the Vampire Hunter in three films beginning in 1998. Cover, Black Panther (2016) #1. Much as T’Challa’s first appearance in print — in the Fantastic Four issue #52 in July 1966 — predated the founding of the Black Panther Party by a few months; the decision to bring him to the silver screen 50 years later ran ahead of major shifts in the discourse about diversity and representation in the entertainment industries. The project was announced as part of Phase Three of the Marvel Cinematic Universe in October 2014, a few months before April Reign launched the hashtag #OscarsSoWhite to draw attention to the racialized economy of recognition in Hollywood, and more than a year before the #whitewashedOUT campaign focused on the casting of white actors in roles written as Asian or Asian-American. It came before Moonlight’s dramatic win for Best Picture at the 2017 Academy Awards. Michael B Jordan and Chadwick Boseman. In a short video clip I first encountered on Twitter, three young men admire the film’s poster, exclaiming, “This is what y’all feel all the time? I would love this country, too.” Activists, educators and scholars from racialized communities have long raised concerns about under-representation and stereotyping in the media and their impact on self-esteem and identity. 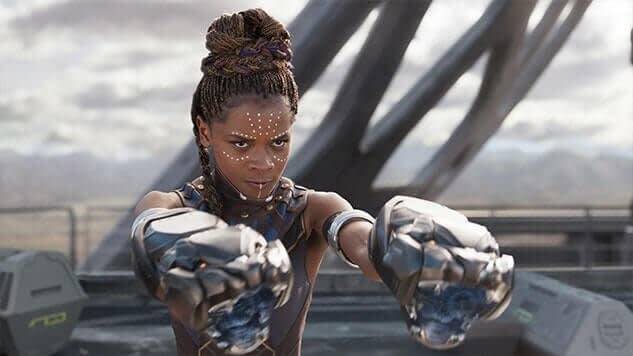 While it is difficult to draw a direct, causal line from watching a movie to an improved sense of self-worth or well-being, it is undeniable that Black Panther —with its nearly all-Black cast, stylish use of hip-hop, lush costuming, and setting in the proudly uncolonized, technologically advanced nation of Wakanda —is giving many of us who have felt under-served by Hollywood a language with which to speak our aspirations. While echoing the broad picture of under-representation, research conducted by Darnell Hunt, Ana-Christina Ramón and Michael Tran at UCLA’s Ralph Bunche Centre for African American Studies also points to the positive incentives towards diversity. Canada and the U.S., which together make up the “domestic” film market, are becoming more diverse, and young people, who are the biggest purchasers of cinema tickets, are the most diverse of all. They say it’s the studio system, but it’s really the people system. It’s who’s running the studio? How are they running it? When you look at Disney with [Tendo Nagenda, executive vice president for production at Walt Disney Studios, and Nate Moore, a producer at Marvel Studios and an executive producer of “Black Panther”], it’s a place that’s interested in representation, not just for the sake of representation, but representation because that’s what works, that’s what’s going to make quality stuff that the world is going to embrace, that’s what leads to success. The studio’s embrace of diversity may be sincere but it is also strategic. Black Panther is a case in point. Coogler and his stars speak movingly about the experience of making this film and what it means to them as African-Americans with more or less immediate connections to Africa. But, at the same time, the studio’s embrace of diversity is also a highly strategic move — 18 films into their mega-franchise. While some critics have begun to call out the ossifying house style of “Marvel movies,” Coogler (like Taika Waititi, director of the recent Thor: Ragnarok) brings a distinctive aesthetic sensibility and critical reputation to bear. The studio may have gambled that the Black film-goers who supported recent films like Hidden Figures and Get Out would pick up the slack as producers reach deeper and deeper into Marvel Comics’ catalogue for characters with less existing brand recognition. We have yet to see if the increasingly vital international audiences — often rhetorically brought up by studio executives as the obstacle to more diverse casting — will also respond positively? Marvel Studios and Disney did not make Black Panther in order to say something about race in America. It is, rather, a product designed to fit into a series, offering familiar pleasures with enough difference to keep the whole franchise interesting. Yet, it arrives at a moment of possibility. Creators involved in its production, at the studio and on set, as well as audiences, have transformed it into a referendum on representation. Putting different faces on movie screens will not solve all our problems, yet the Black Panther phenomenon demonstrates that people are crying out for chances to see themselves and their communities portrayed with dignity and diversity —as heroes, villains and everyone in between. Will the executives who control the purse strings listen ?